As the growing volume of international travel has demanded greater attention from border control authorities, governments and their immigration ministries face many decisions on how to design programs that process travelers more efficiently–without sacrificing security. The current system, in which customs and/or immigration officials manually process passengers at borders, calls for significant resources and infrastructure and is generally time consuming for passengers and border authorities. Passengers may be interviewed or examined, and their baggage and travel documentation is inspected. Public opinion is that this current system of processing travelers tends to be cumbersome and inefficient, and it further supports the growing need to accurately identify travelers in a more cost effective, efficient manner for security and border control purposes. New technologies, however, are enabling border security officials to address this problem, and some promising new systems are being implemented that may prove suitable for broader applications. One such model in the works has its roots in the 2007 Cricket World Cup (CWC). For that event, the participating host nations in the Caribbean Community (CARICOM) used a novel border security program to handle the high volume of travel between Barbados, Jamaica, Trinidad and Tobago and the other host countries. Consulates of the participating nations implemented a number of technologies and protocols to enhance visa security and issuance efficiency during the event and nearly 50,000 machine-readable visas were issued in the months leading up to the tournament. The security infrastructure put in place included an Advance Passenger Information System (APIS) for all in-bound and out-bound flights, a Joint Regional Communications Center, Regional Intelligence Fusion Center and a regional watch list, in addition to the machine-readable visa issuance system. This system eased congestion at the participating consulates and kept air travelers moving through the temporarily established Single Domestic Space (SDS) with minimal border crossing formalities. Following the successful use of these systems during the cricket event, CARICOM began discussions about how to continue using the existing infrastructure for travel between the countries, and to expand its availability to additional CARICOM states. The result of these discussions came to fruition with the introduction of CARIPASS, a travel card program that provides secure, simple border crossings for citizens and legal residents of 10 CARICOM nations: Antigua and Barbuda, Barbados, Dominica, Grenada, Guyana, Jamaica, Saint Lucia, St. Kitts and Nevis, St. Vincent and the Grenadines, and Trinidad and Tobago. The region is in the process of deploying a multilateral border crossing program. And with the introduction of CARIPASS, participating governments aim to enhance regional security and support expedited travel throughout the member states. To participate in the voluntary program, eligible travelers must pre-enroll and have a facial image and two fingerprint images captured. After successfully passing the security vetting stage and paying a non-refundable processing fee, users are then issued a CARIPASS card with a 2D barcode, valid for either one or three years, which they can use to pass through self-service border crossing gates. At the gates, connected to the system’s user database, two biometric checks are conducted. Fingerprints captured at the time of passage are compared to the fingerprint templates stored on the card’s 2D barcode. Additionally, a photo taken at the gate is compared via facial recognition to the card holder’s image stored in the system database. If matched, the gates open allowing the traveler to pass through. The gate prints a receipt for the traveler to document his or her valid entry. Users may then proceed directly to baggage and customs halls. The CARIPASS system was designed by 3M Security Systems following CARICOM’s use of 3M’s Identity Document Issuance Systems for the Cricket World Cup. The CARIPASS program builds on those existing tools and uses several new technologies that 3M sourced and integrated in response to CARICOM’s needs. After gaining a thorough understanding of the nature of travel between the participating countries and CARICOM’s goals in expediting this traffic, 3M security experts were able to introduce a complete solution, integrating the necessary peripherals and software to make CARIPASS a reality. One of the system’s most important components is the new electronic immigration gate, the 3M Autogate Solution. The technologically sophisticated design of the Autogate enables the rapid identification and external verification of travelers, with links to local and central database systems. 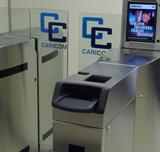 Autogates automate the border clearance process, allowing CARICOM to focus its immigration resources on higher risk travelers, while low-risk travelers (CARIPASS holders) benefit from quick and convenient self-processing. In addition to the conventional Autogates, handheld “portable Autogates” are also being used at several smaller airports within the system. These devices connect to the same databases as the traditional Autogate but are designed for use in facilities with less available space. Border officials are able to read travelers’ CARIPASS cards through the machine and issue a receipt from a belt-mounted printer, enabling quick passage even in remote facilities. The concept of a self-service border control lane may initially raise concerns about security and oversight, however, CARICOM’s system is designed to thwart breach attempts during both the document issuance and border crossing steps. First, by only providing the CARIPASS to pre-screened, authorized citizens and residents, CARICOM controls the issuance process and has the ability to vet travelers in advance, helping to assure that only low-risk travelers receive access to the gates. Additionally, the Autogate incorporates several features to help ensure security while travelers pass through. The gates use an optical turnstile technology with multiple beams in the optical detection array, and a tailgate detection technology senses if a traveler is being followed through the gate. Furthermore, the barriers close as soon as a traveler has cleared the path, helping to ensure that only the verified passenger is allowed to pass through. Perhaps the most significant benefit to border control authorities is that by streaming travelers according to risk–and processing known, pre-screened travelers using self-service gates–valuable human resources are freed up for other tasks such as processing higher risk and unknown travelers. Using systems similar to CARICOM’s, many other border control authorities stand to benefit. The enhancements brought about by CARIPASS are significant for the governments and travelers. Border control authorities can better manage increasing passenger numbers, even during peak periods, and can achieve enhanced border security without additional pressure on space and infrastructure. Travelers between the participating countries–even those not participating in CARIPASS–can enjoy enhanced efficiency and service, because the program diverts some passengers to Autogate processing. The multilateral cooperation of CARICOM states has enabled the implementation of a unique system, which can serve as a model for other governments and border control authorities. While each border is different, CARICOM’s program demonstrates that the technologies and expertise are available to customize solutions for individual applications, helping to ensure that other nations can achieve enhanced efficiency. Capture facial image and using facial recognition compare live face to stored facial image. Steven Grant is business development manager for 3M’s security systems division. Grant has been with 3M for more than ten years working on projects related to passports and other identity documents, border management and biometrics. Grant spent several years as 3M’s delegate to the Simplifying Passenger Travel Interest Group, an organization managed by IATA.